Developing a breakthrough product requires breakthrough thinking. That’s why hundreds of thousands of engineers and creatives use the techniques in our Expert Product Development Module to expand their minds, and create multi-million dollar ideas. Product life cycles are getting shorter. With the high cost of getting your new idea above the noise of the marketplace, it’s vital to have an edge. ThoughtOffice gives you that edge, with the world’s brightest minds working for over 20 years to empower you with their collective knowledge. Need to stoke the boilers of your new product engine? 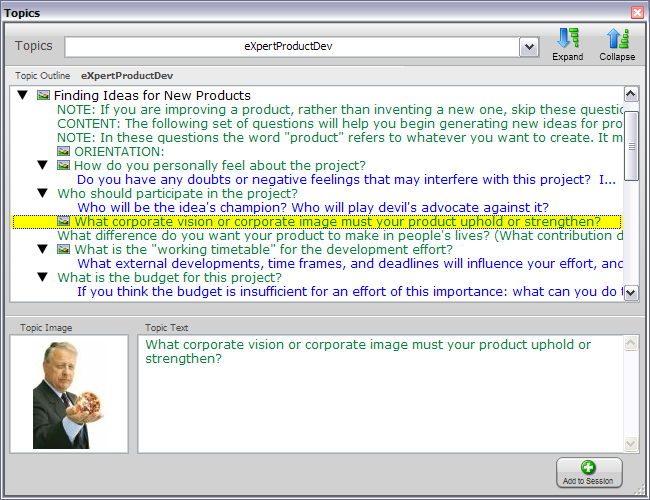 Couple the guidance of the ThoughtOffice Expert Product Development Module with our integrated IdeaBrowser. You’ll find well over 10,985,690 creative stimuli that will provide breakthrough thinking in every level of your organization. And in these difficult economic times, every minute without a new idea, or a new approach to solving your customer’s problems, is just another chance for your competition to do it first.